People pass a wayside pulpit, St Andrew and St George, Bolton. This church is still in use by the United Reform Church (2012). 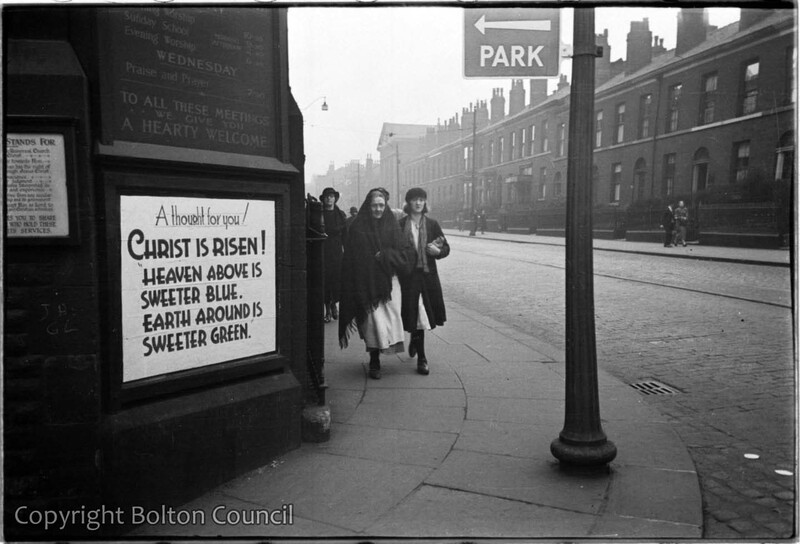 The Worktown Study was particularly interested in ‘wayside pulpits’- the religious messages which churches put up around Bolton. There are a number of these photographs in the Worktown Archive and a collection of notes on these church notices in the Mass Observation Archive. Mass Observation planned to publish a study of religious life in Bolton to follow on from John Sommerfield’s The Pub and the People. It was planned that Humphrey Spender’s photographs would be used to illustrate this survey, as they had been in Sommerfield’s book, and so many of the Worktown photographs are of religious buildings and services.